A training café which supports people with learning disabilities gets a new look thanks to a local firm’s in-kind support via Cumbria Exchange. 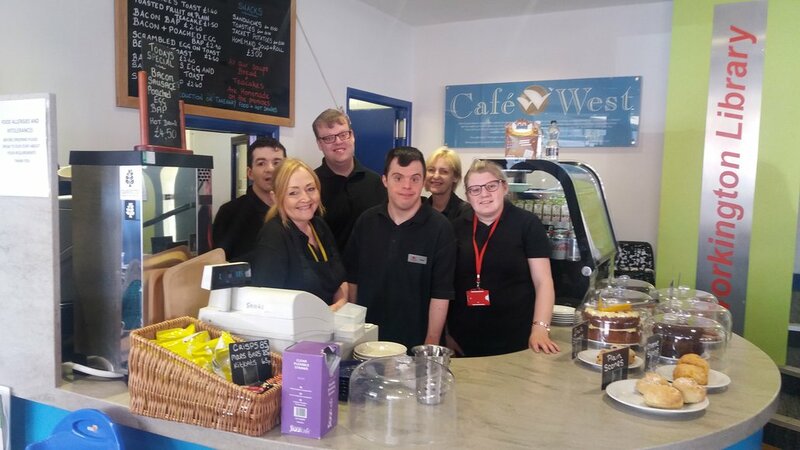 Café West at Workington Library is run by charitable organisation West House, providing employment and training opportunities for people with disabilities. The Café, which is highly valued and supported by the local community in Workington, needed a refresh and West House’s fundraising Manager, Emma Robinson, appealed for help with the redecoration. Bell Group Carlisle, in partnership with its supplier Johnston’s Trade Paints, were delighted to offer their support to this fantastic local café and training centre and rose to the challenge in order to meet the tight timescales involved in the project. The full refurbishment was completed over a two day period while the café was closed to tie in with other works that were taking place in the library. Fundraising Manager Emma Robinson said: “We’ve been so impressed by Bell Group – not only did they offer to do this refurbishment for us at no cost, and worked with their suppliers to donate the paint, but they also did it at very short notice, so we could fit in with other library refurbishments. Their decorators were absolutely lovely with our trainees and we’re just so delighted with what they’ve achieved. Bell Group obviously really care about giving back to the community and what they’ve done has made a real difference to our café”. Café Manager Alison Ostle said: “We are over the moon with the redecoration. It makes such a difference, the paint was getting quite tatty but now it looks amazing. We can’t thank Bell Group and their suppliers enough. We hope it will make it more pleasant for our customers and that it will attract more people into the café to support our trainees”. Mike Neile, Branch Manager, Bell Group Carlisle, added: “We were delighted to support West House in their goal of refurbishing Café West. As a business we are proud to support local organisations and its important for our team to be able to give something back to the areas that they live. Yet again they have done an excellent job and they really enjoyed volunteering their time at Café West”. The redecoration of Café West making it more pleasant for customers and attract more people into the café to support the trainees.